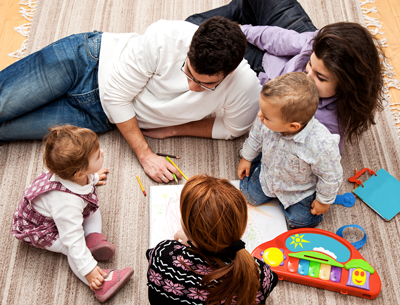 The Healthy Families New York Home Visiting Program offers home-based services to support expectant families and new parents with the changes and needs that often come with the birth of a new child. Services are voluntary and provided at no cost. A specially trained staff member may meet with you to further explore the strengths and stressors that are unique to your family. After this discussion, you may be provided with referrals to services in your community that can help you meet your needs and goals. A Family Support Specialist (FSS), hired from and representing the language and culture in your community may offer on-going support.Â This FSS partners with you to support you right from the start.Â They work with you and your family in your home environment.Â Home visits often begin prenatally and may be offered until your child is in school or Head Start.Â Â They may be provided on a weekly basis at first but decrease over time. Connecting you with medical providers for prenatal/well-baby visits and immunizations. Providing information on prenatal care, parenting, infant and child development, and child health. Demonstrating activities for you to practice with your child to increase bonding and to stimulate cognitive and physical development. Assessing your child for developmental milestones and providing referrals for early intervention if needed. Helping your family access community resources and services, such as job training, ESL classes, legal services, GED preparation classes, and health care. You and your family may also have opportunities to attend social and educational events. These events enable parents to establish connections with other parents of young children and share parenting experiences, successes, and challenges. Healthy Families New York works to nurture healthy parenting for healthy babies.